When the people at Storymoja Publishing started their first festival in 2008 they were trying something new. They wanted to do a festival for book lovers but they didn’t believe that enough of us would leave our local bars to go somewhere to talk about books. The organisation opted to have the “Nyama Choma Festival” where book readers could join the drunks as they quaffed cold beers and ate copious amounts of roast meat. It was fortunately something that fail to work and the next year they stopped trying to con us with nyama choma and in the following years adopted first the Storymoja Festival, then the Storymoja Hay Festival and finally the Storymoja Festival. Last weekend our friends from Storymoja decided to try out this “county thing” that everyone has been making noise about and landed on Nakuru County. Poor county. Whereas Nairobi folks were researched as being drunks, thus Nyama Choma festival, the Nakuru people were seen as people who are very worried about jobs. So the edition was called Storymoja Careerpedia. Lucky county. 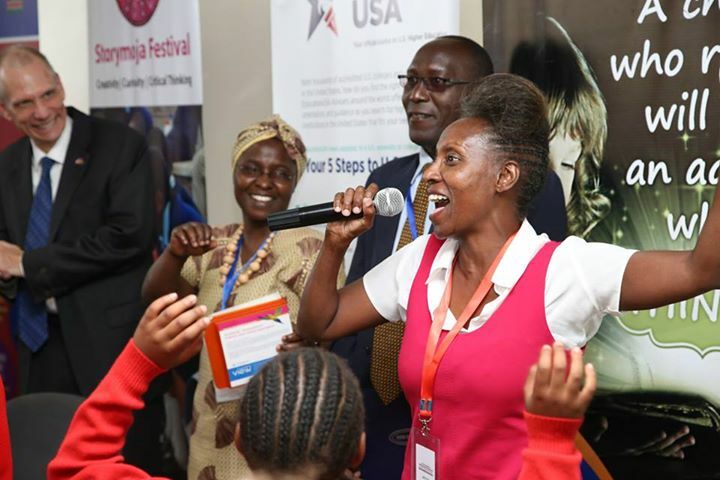 It was a three day affair from Thursday 28th May to Saturday 30th May where some of the brightest minds around were presented to the residents of Nakuru. The event was filled with young minds from schools from around the primary and secondary schools in the area. They were very happy to be there them kids. Some the names who presented included Dr Auma Obama, Muthoni Garland, Ken Walibora, Wallah Bin Wallah, Kinyanjui Kombani and other writer types. There was also folks like Boniface Mwangi who unleashed his much loved “Diaper Mentality” exhibition where he uses images to lampoon politicians and other such nasty characters in our society. Also there is the dance judge on that TV show Joanne Ball Burgess who was giving the audience who showed up not only dancing but life tips. And then there were performances by folks like singer Valentine Ziki. Did I forget to mention that the Bloggers Association of Kenya popularly know as Bake led by Kennedy Kachwanya was in the house? It was full on event happening there are the Nakuru Library. I’m putting ten bob down on the festival returning just as “Storymoja Nakuru.” Any takers?